Ruth Pauline Osborn, 88, of Spring Hill, KS passed away May 26, 2016 at Olathe Hospice House. She will be in state from 10:00 am to 4:00 pm Tues., May 31, 2016 at Bruce Funeral Home, Gardner, KS (913) 856-7111. Graveside service and inurnment 1:00 pm Wed., June 1, 2016 Gardner Cemetery, Gardner, KS. Memorial contributions may be made to Olathe Medical Center Charitable Foundation Hospice House. Ruth was born Dec. 17, 1927 in Gardner, KS to Joshua and Edna (Harding) Kingsley. She was a life-long area resident. Ruth graduated from Gardner High School in 1945. She married Robert James Osborn Oct. 6, 1951 at the First Methodist Church, Olathe, KS. 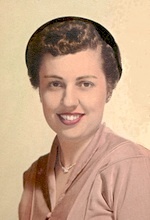 Ruth was employed as a secretary for Johnson County Title and Trust, the Gardner Presbyterian Church and Cramer Chemical. Her most recent job was as a medical transcriptionist at Olathe Hospital. Ruth enjoyed writing poems, attending the book club at Gardner Library, liked cooking, baking pies and raising flowers. She was a “cat” person and a “doctor” to the injured little animals her boys would bring home. She will be dearly missed by family and friends. She was preceded in death by her parents; husband Robert, April 22, 2016 and siblings: Ralph, Wayne, Ella, David, William, Elvin, and Edward. Ruth is survived by her sons: Robert and wife Sandy Lawless, Loveland, CO and William and wife Paulette Osborn, Spring Hill, KS; three grandchildren and three great-grandchildren.